Dried shiitake mushrooms (干香菇, gan xiang gu) are made from smoked fresh shiitake mushrooms, and they have an intense smoky flavor and a meaty texture. Dried shiitake mushrooms are one of the most important ingredients in Chinese cooking, and are widely used in stews, soups, braised dishes, and stir fried dishes. They have a very concentrated flavor and most of the time cannot be replaced by fresh shiitake mushrooms. 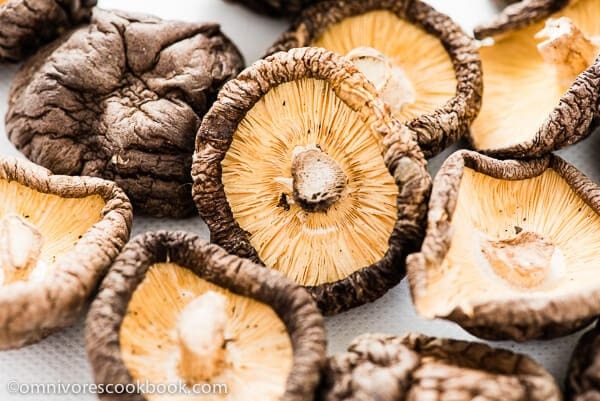 To cook with dried shiitake mushrooms, they must be rehydrated before using. Follow the steps below. Gently rinse shiitake mushrooms with tap water. 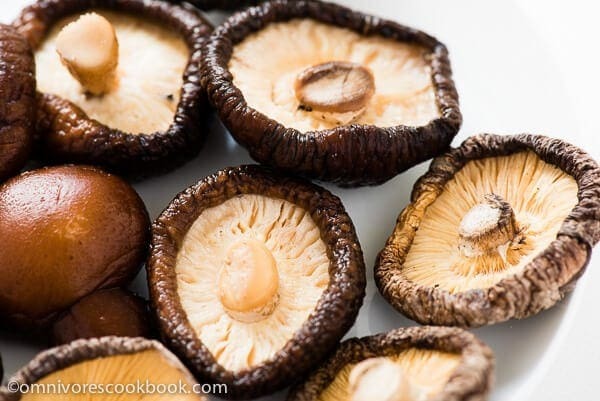 Place shiitake mushrooms in a bowl and add warm water to cover. Let them sit until the mushrooms turn soft and springy. It usually takes 20 to 40 minutes, depends on the size of the mushrooms. Use hands to gently wash the mushrooms with the re-hydrating water, to remove dirt entirely. Gently squeeze the extra water from the mushrooms. Trim the tough ends with scissors. Mushrooms can be used whole or sliced. Transfer the mushrooms to a colander to drain. Save the re-hydrating water. Let re-hydrating water sit a while before using and do not use the solids on the bottom. Water can be used as a vegetable stock in a stew, soup, or stir fried dish. You can find dried shiitake mushrooms at most Asian market. You can also buy them sliced or whole on Amazon. I personally prefer to use whole mushrooms. If you want to save cutting and rehydrating time, you can get the sliced ones instead. Sliced them and add into stir fried noodles. Use them to replace meat in mapo tofu to create a vegetarian dish. Add it into stew or braised meat to enhance flavor. Slice it and top on blanched green vegetables and drizzle with garlic soy sauce (My recipe doesn’t contain mushroom but you can add them. It’s a very delicious dish). Slice it and add into soup to enhance flavor. Store dried shiitake mushrooms in air-tight bag or container in room temperature.